It was the February meeting of the Democratic State Committee. Hundreds of party leaders from across Pennsylvania braved the winter weather to choose a candidate to endorse. At one point, Joe Sestak wasn’t even permitted to speak. It’s been a long year since then-Representative Sestak lost the committee’s endorsement to Senator Arlen Specter by a 3-1 margin. A long time since Sestak stood on the other side of a rope line featuring Specter, Senator Casey, and then-House Speaker Nancy Pelosi. A long time since, requesting the chance to rebut a dig from Specter during the committee’s dinner, Sestak was summarily waved off by then-Chairman T.J. Rooney. Indeed, his opposition to the Democratic establishment was a hallmark of Sestak’s primary campaign. Sporting his trademark Navy bomber jacket, Sestak received a hero’s welcome from the committee when he dropped by their most recent meeting on Saturday (video below). The change of tune by Democratic committee members is only half the story. All of a sudden, Sestak is actively seeking the favor of folks he dismissed a year ago. Now Sestak looks right at home, meeting and greeting those same insiders with ease. His 67-county “thank you” tour” tour took him almost exclusively to local Democratic committees. And the Admiral has openly talked about a future in public service. Rumors naturally abound any time 400 politicos gather in one building. However, one persistent idea that PoliticsPA heard from several sources, was that Sestak is considering a run for Governor in 2014. One source said he was in the room with Sestak and his advisers while they discussed a gubernatorial campaign. Those are two accounts of several. Hannah Zale, a spokeswoman for the former Congressman, dismissed the speculation. But then again, Sestak still has a staff. One thing is for sure: if Sestak does decide to run in 2014 or any other time, he’s ready, willing and able to court support from these Democratic insiders. all i have to say is: how are the republicans doing, is this what everybody wanted? the people lost the elections because they bought the bag of fertilizer the republicans were selling…this has become a country of sheeple…people who believe everything they are told with out lifting a finger to look for the truth. Poor David Diano. Now that PA2010.com is finished, he has to come troll around PoliticsPA. We all know you simply hate Joe because he wouldn’t pay you for your stupid VoterWeb. That’s that. How can you possibly argue that Sestak is responsible for the “depth of the losses” statewide? That’s idiotic. Why not blame Dan Onorato, who couldn’t even win his home county and was a drag on Democrats around the state? Joe Sestak got more independents and moderates voting for a Democrat than otherwise would have been possible. His entire strategy relied on winning over undecided voters. Throwing his lot in with the Democratic apparatus would have been suicidal. You think Specter would have done better?!? What a joke. Specter would have been crushed by Toomey, and you know it. As for your blaming Sestak’s decision not to join the “coordinated campaign,” that’s another straw man. The “coordinated campaign” didn’t even begin until the end of the summer, by which time Sestak had nearly twenty offices open around the state. He was supposed to just pack it in and send all of his money to Harrisburg so the state party could mess up yet another election? Your precious “coordinated campaign” never had a prayer of getting Dan Onorato elected, and could only have been a drag on Sestak. At least one of our candidates came close, which is more than we could have said if Specter had been on the ticket. And if you somehow think Sestak can be blamed for the defeats of Dahlkemper, Murphy, Kanjo, etc., then I don’t know what you’re smoking. Lastly, I love reading you freak out about how he pays his staff now. You seem to think Sestak is stupid or something. Why would he pay his staff out of any campaign account? First of all, I’m sure the campaign ran out of money during the campaign. Second of all, Sestak isn’t running for anything now, state, federal, or other. And why would you imagine he would pay out of anything other than his own pocket? He and his wife have plenty of money. He’s a private citizen now. He’s allowed to hire whomever he wants and pay them with his own money. David, I hope you find some happiness someday. I suggest you start by simply ignoring Joe Sestak for the rest of your life. We’ll all be happier. Tony- It is 100% to blame Sestak for the final depth of the losses. Sure, the losses were going to be deep, but Sestak made them even DEEPER by his REFUSAL to participate in a coordinated campaign. Despite running in the Primary to “lead the ticket”, he abandoned the party and the other candidates. He dropped “Democrat” from his ads, he made those ridiculous “Admiral” t-shirts that didn’t even contain the word “Democrat”, and even on election day his team distributed GOTV door-knockers with ONLY Sestak and not the rest of the ticket. The man’s a fraud, when it comes to any interest or support for the party or other candidates. As for Specter, he understood the importance of working with the party for the ticket. Without Sestak’s primary challenge, we would have had and extra $10 million to fight Toomey, and that would have left more money for the other candidates. Sestak’s fundraising machine sucked the oxygen and needed funds/resources from elsewhere in the state. Judy- Sestak is no liberal (uber or otherwise). He’s a fake liberal and likely a closet conservative. Another tax-payer-funded job, Joe? Look, I have great respect for the man’s military service. It’s more than I ever did. But this man’s ego knows no bounds. I live in his former district. He was a mediocre Congressman at best. He was notorious for running his staff into the ground – highest turnover rate of any Congressman. When his attempt for Governor is unsuccessful will he then announce his plans for the Presidency? Hang it up, Joe. 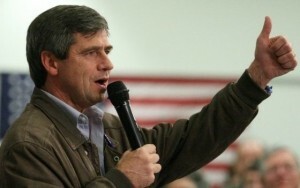 Sestak for Governor sounds like a fine idea to me. How about teaming him with either Holden, Altmire, or Critz for LG? Whichever moderate, centrist Democrat is the victim of reapportionment gerrymandering? Perfect this uber liberal can run and run and run but omg he can not hide, neither his views, nor his agenda and not even his pay to play junk with Obama. This guy is caught on tape spinning webs of mis infomation either the WH tried to bribe him or they did not, it they did he failed to report a crime if they did not he’s a liar! Now for the attacks! Blaming Joe Sestak for the depth of losses in 2010 is bullsh-t David and you know it. Is Joe Sestak responsible for the depth of Democratic losses in Ohio, Wisconsin, Michigan, Florida and almost every other swing state? Democrats ran in 2010 against the strongest headwinds since 1994. Put Arlen Specter atop the 2010 Democratic ticket in Pennsylvania and I assure you the losses would have been far deeper. Joe Sestak is a mini-version of Wesley Clark and has as much a chance of winning a political seat in PA as Clark does/did in winning the nomination for president. Does this mean the Clinton machine is going to be back in business again trashing and thrashing to get the olde boy in. Similar to what they did to Weldon, while he was getting too close to the real story of the failure of the CLinton administration to prevent 9/11 ! Good point about the staff. Who’s paying for the staff? If the funding is coming out of his FEDERAL Senate funds for a STATE Governor’s race, that’s a violation. As for his line about “Doing it all over again” just to lose. This has to go on the top 5 list of dumbest things said by politician. If everybody knew Joe was going to lose, and waste ten million dollars, that’s an argument for running Specter, not running Joe again. I was at the event Friday night, and there wasn’t a lot of love for Sestak. Many (rightly) blamed him for the depth of our statewide losses for his refusal to cooperate on a coordinated campaign.